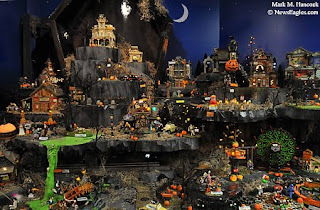 An entire scene of Halloween decorations appears in the midst of the massive Bronner's Christmas Wonderland in Frankenmuth, Mich. on Tuesday, June 2, 2009. 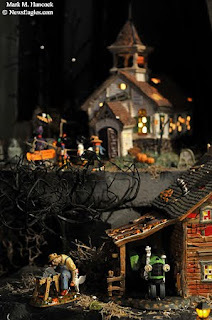 A farmer prepares to slaughter animals near a barn in the "An Ax To Grind" Halloween Village decoration at Bronner's. 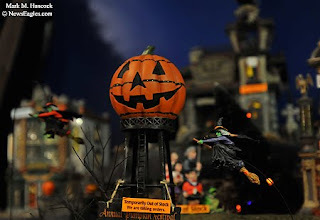 Mechanical witches fly on brooms around a Jack-O-Lantern water tower in a Halloween display at Bronner's. 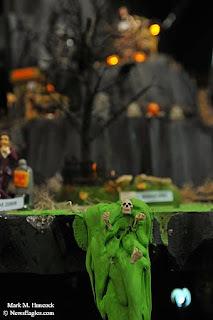 A threadbare skeleton waits on a train outside the "Rickety Railroad Station" 10th Anniversary Piece in the Halloween Village at Bronner's. 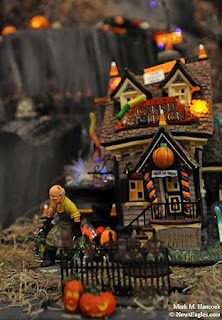 A worker moves buckets of toxic food as "Time To Feed The Monsters" outside "The Candy Cauldron" in the Halloween Village display at Bronner's. 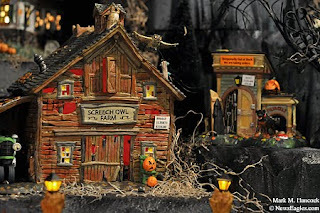 Owls fly from the "Screech Owl Farm" in the Halloween Village display at Bronner's. 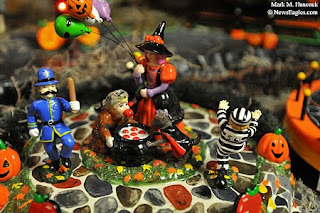 Terrified children figurines try to find their way around the Halloween Village display at Bronner's. 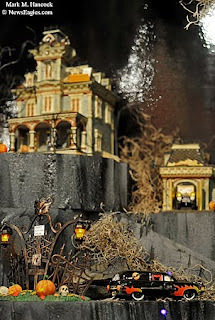 "Grimsly Manor" sits atop a hill in the Halloween Village display at Bronner's. 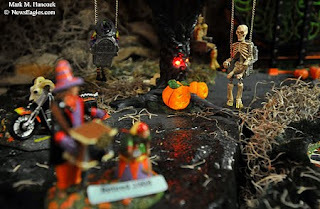 The "Skeleton Crew" fishes in a pond of toxic sludge in the Halloween Village display at Bronner's. 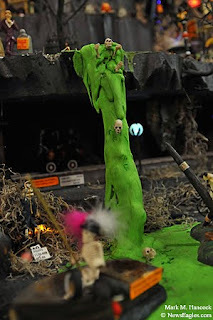 New arrivals are always dropping into the toxic pond in the Halloween Village display at Bronner's. 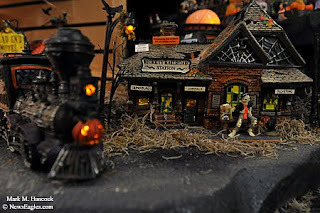 The tiniest of details are represented and feature mechanical motion and electrical lighting in the Halloween Village display at Bronner's. 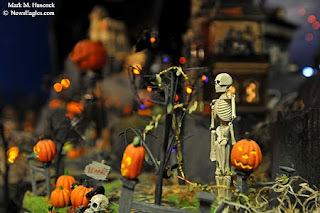 In the carnival area, a skeleton and its friends take a spin on a mechanical swing ride in the Halloween Village display at Bronner's. 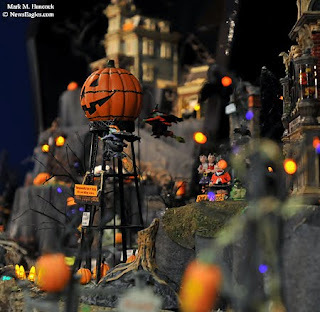 Not all is macabre in the Halloween Village display as a mechanical Keystone cop chases an escaped convict around a family bobbing for apples at Bronner's in Frankenmuth, Mich. Please see Fayrouz's photos throughout the entire store. FC Dallas' David Ferreira (10) keeps control of the ball as Real Salt Lake's Robbie Russell (3) defends during a Major League Soccer game at Pizza Hut Park on Saturday, September 26, 2009 in Frisco. 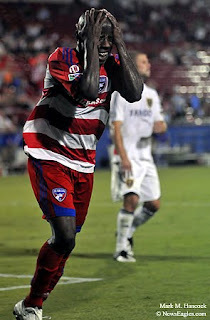 Ferreira scored FC Dallas' second goal. FC Dallas' Dax McCarty (13) passes around Real Salt Lake's Will Johnson (8) during a Major League Soccer game at Pizza Hut Park. 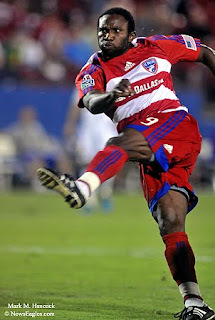 FC Dallas' Jeff Cunningham (9) fires the first goal against Real Salt Lake during a Major League Soccer game at Pizza Hut Park. FC Dallas' Jeff Cunningham (9) watches as a teammate's shot goes wide of Real Salt Lake goal keeper Nick Rimando (18) during a Major League Soccer game in Frisco. 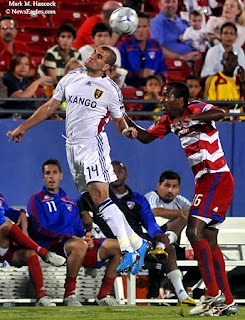 Real Salt Lake's Yura Movsisyan (14) gets a header before FC Dallas' Atiba Harris (16) during a Major League Soccer game at Pizza Hut Park. FC Dallas' Jair Benitez (5) agonizes over a missed goal against Real Salt Lake during a Major League Soccer game at Pizza Hut Park in Frisco. 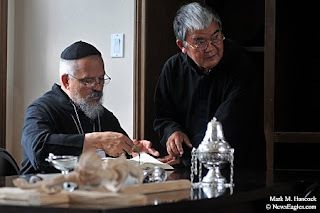 Abbot Philip Lawrence of the Christ In The Desert Benedictine Abbey in Albuquerque, N.M. (left) selects readings with Tran Van Thu (right) before the inaugural ceremony of the Benedictine Monastery of Thien Tam in Karens, Texas on Saturday, Sept. 19, 2009. Celebrants gather in a large tent at the end of a country road before the inaugural ceremony of the Benedictine Monastery of Thien Tam in Karens, Texas. Named in this slideshow are (in order of appearance): &nbsp Tony Nguyen, Tran Chieu, Abbot Philip Lawrence, Tran Van Thu, Bishop Kevin J. Farrell, Abbot Anselm Atkinson, Hoang Ngoc Quy, Matthew Tran and P. Valentin Tenos Bortrina. 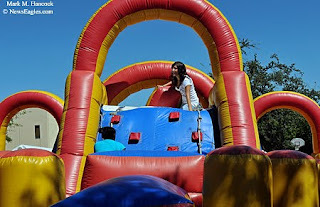 Corina Cerrone, 14, (top) encourages Kelly Redmond, 14, (left) to climb a rope in an inflatable maze during Holy Spirit's Fall Festival in Duncanville on Sunday, September 27, 2009. 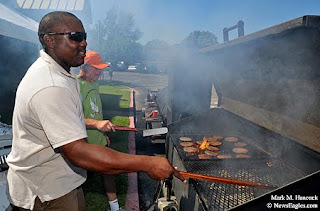 Knights of Columbus representatives Barry Barksdale (left) and Mike Rumsey (right) turn burgers during Holy Spirit's Fall Festival. 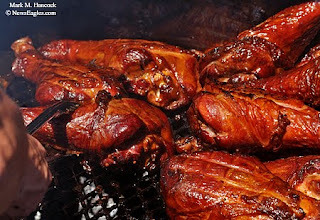 Martin Svatek rotates turkey legs in the smoker during Holy Spirit's Fall Festival in Duncanville. 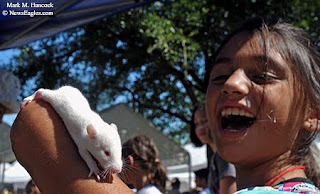 Rianna Duvall, 8, lets an albino rat climb up her arm in a petting zoo during Holy Spirit's Fall Festival. 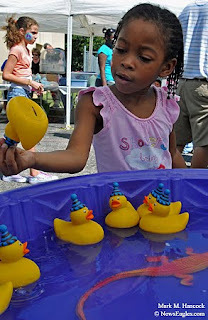 Catherine Walker, 5, selects a prize-winning duck in the game area during Holy Spirit's Fall Festival. Chris Edward, grand knight of the Knights of Columbus No. 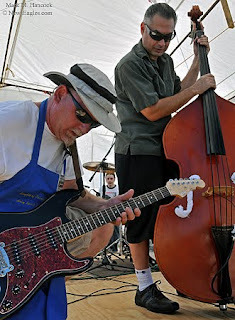 8157, (left) tunes his guitar before playing with Thrillbilly bandmates Jimmy Duvall (right) and Cody Duvall (center on drums) during Holy Spirit's Fall Festival in Duncanville. Fr. Michael Dugan (left) and Bishop Kevin J. Farrell (right) celebrate during the annual Holy Sepulcher Mass at Christ the King Catholic church in Dallas on Tuesday, Sept. 15, 2009. Attendees celebrate the annual Holy Sepulcher Mass at Christ the King Catholic church in Dallas. 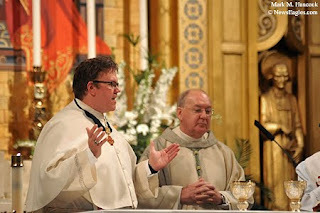 Named in this slideshow are: Bishop Kevin J. Farrell, Msgr. Donald Zimmerman, Fr. Michael Dugan, Fr. 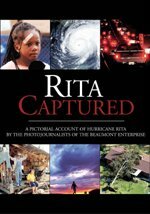 Tony Ruiz C.M., Harold Meier, Esther Tobar and Rudy Tobar. 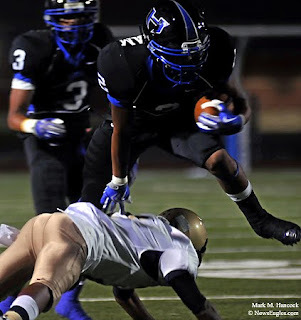 Hebron's Dezmond Wortham (2) leaps over Jesuit's Alonzo Young (2, bottom) during a high school football game at Hebron High School in Carrollton on Friday, Sept. 17, 2009. 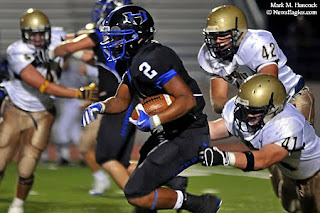 Hebron's Dezmond Wortham (2) tries to escape from Jesuit's Pete O'Brien (41) and Gus Dossett (42) during a high school football game at Hebron High School. Jesuit's Pete O"Brien (41) gets a handle on Hebron quarterback Kyle Aubuchon during a high school football game in Carrollton. 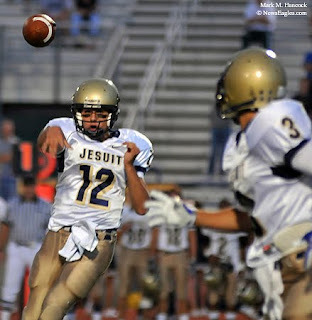 Jesuit quarterback Jackson Oliver (12) passes to David Kaplan (3) during a high school football game at Hebron High School. 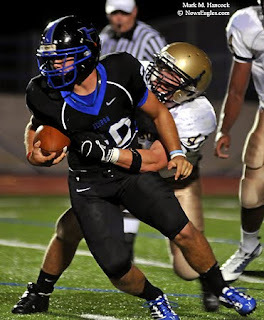 Jesuit's David Kaplan looks for an opening as Hebron's Joe Akins closes the door during a high school football game. 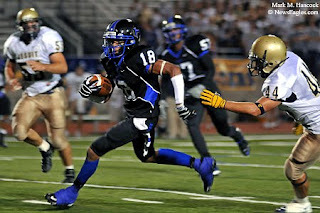 Hebron's Chad Barlow (18) sprints past Jesuit's Jimmy Gross (44) during a high school football game at Hebron High School in Carrollton. 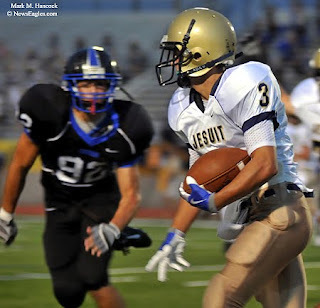 Jesuit won the game 38-35. 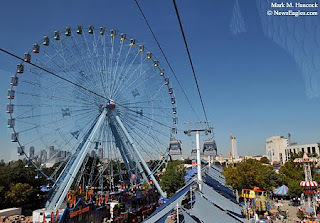 The Texas Star dominates Fair Park during the State Fair of Texas in Dallas on Saturday, September 26, 2009. The wheel first spun through the Texas sky in 1985. Fayrouz, my sister and I went to the State Fair of Texas. We didn't stay long, but it was a nice day, and we had fun. This weekend is the final weekend for the fair as well as Texas/OU weekend. If y'all haven't gone and gotten some fried butter or a corny dog, it'll be crowded, but it's your last chance. Please also see the "Women & Spirit exhibition" slideshow before you go. 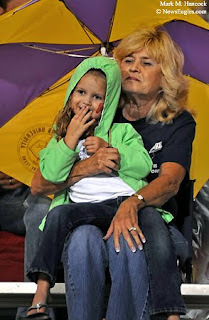 Martha Mansfield protects her granddaughter Kaedyn Hollingsworth, 4, from the rain before a high school football game between Allen and Rockwall in Allen on Sept. 11, 2009. Rain delayed the game one hour. 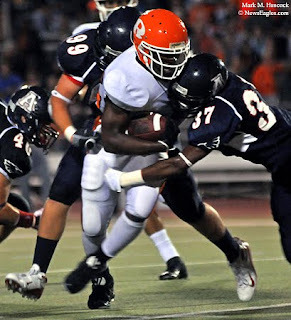 Rockwall's Del Myles (35) gets hit by Allen's Josh Reed (37) and Tracey Smith (99) during a high school football game. 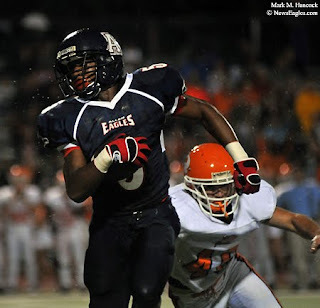 Allen's Jonathan Williams (5) outruns Rockwall's Andrew Douphrate (46) during a high school football game in Allen. 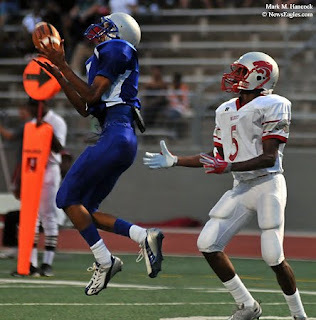 Adamson's Derek Victor (3) snags an interception in front of Woodrow Wilson's Elverette Lee (5) during a high school football game at John E. Kincaide Stadium in Dallas on Thursday, Sept. 3, 2009. 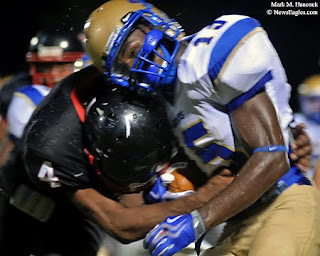 The play was called back due to a penalty. 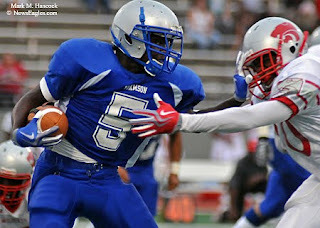 Adamson's Airron Cowthran (5) keeps Woodrow Wilson players at bay during a high school football game in Dallas. 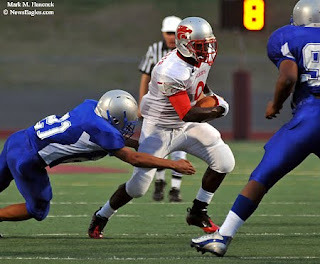 Woodrow Wilson's Carl Harris (9) looks for a hole in Adamson's defense during a high school football game. 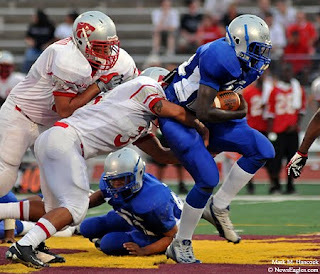 Adamson's Qwaii Clark (24) drags Woodrow Wilson's Cesar Silva (35) and Jose Moreno (64) at John E. Kincaide Stadium. 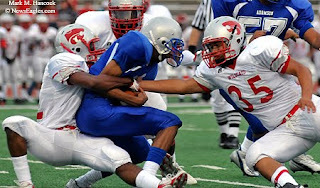 Woodrow Wilson's Hector Hernandez (12) takes down Adamson's Derek Victor (3) as Cesar Silva (35) helps during a high school football game in Dallas. 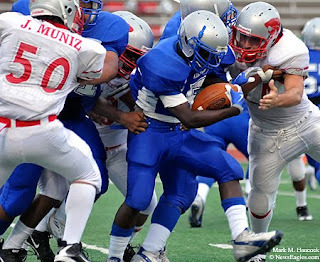 Adamson's Airron Cowthran (5) powers past Woodrow Wilson's Juan Muniz (50) and Mitchell Hanby (24) during a high school football game at John E. Kincaide Stadium in Dallas. 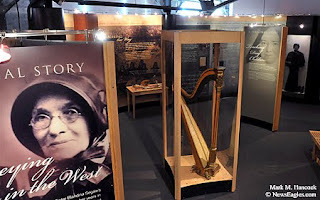 A section displays the prominence of sisters in the United States' westward expansion at the "Women & Spirit: Catholic Sisters in America" exhibit in the Women's Museum at Fair Park in Dallas. The "Women & Spirit: Catholic Sisters in America" exhibit is currently in the Women's Museum at Fair Park in Dallas on Saturday, September 26, 2009. The traveling exhibit, which traces the achievements and contributions of American women religious, will be open to the public during the State Fair of Texas and will stay until December. 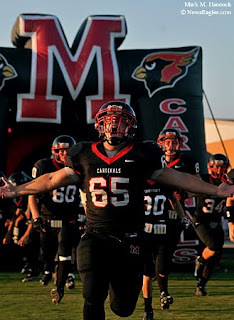 Melissa's Kelton Brewer (65) leads the team onto the field before a high school football game against Nevada Community at Cardinal Stadium in Melissa on Friday, Aug. 28, 2009. 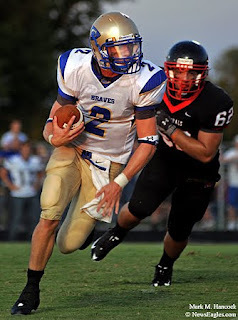 Nevada's quarterback Collin Strahan (2) looks for an opening as Melissa's Dylan Parker (62) gives chase during a high school football game in Melissa. 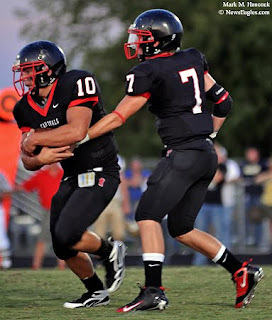 Melissa's quarterback Aaron Bush (7) hands the ball to Cody Morgan (10) during a high school football game against Nevada Community at Cardinal Stadium. 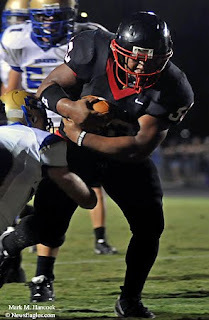 Melissa's Nick Palmer (33) powers his way to a touchdown during a high school football game against Nevada Community at Cardinal Stadium. 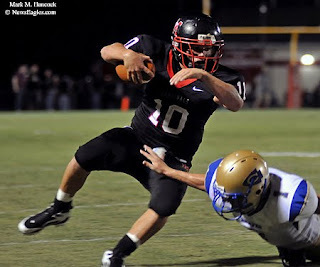 Melissa's Cody Morgan (10) avoids a tackle from Nevada's Clint Woolf (1) during a high school football game. Nevada's Tim Underwood (15) takes a fierce hit from Melissa's John Young (4) during a high school football game at Cardinal Stadium in Melissa.